Pinnacle Healthcare Consulting will be exhibiting at AHLA on October 5-7th (Baltimore, MD). Please stop by our booth to meet our team members! Pinnacle Healthcare Consulting will be exhibiting, sponsoring and presenting at the New York Metro ASC Symposium on September 14th. Please stop by our booth to meet our team members. Usually when a healthcare business focuses on increasing the value of its business, the idea revolves around improving the speed of patient care, improving contracts, and paying close attention to the cost of supplies and other tools of the trade. One way of increasing value that may not sound groundbreaking on the surface is increasing the debt of the company. The Ambulatory M&A Advisor goes though the ways that debt can increase the value of a healthcare business, some of the risks involved, and what the market looks like today for physicians looking to increase value in this way. Todd Zigrang, President of Health Capital Consultants says healthcare entities use debt financing as a way to meet their immediate objectives as well as pursue some extended goals. “The value is driven by the stream of the expected benefits flowing to the equity holder of that enterprise. The initial theory holds that for each firm there exists an optimal capital structure which is the mix of debt and equity, that maximizes the value of the firm. This benefit arises mainly from the tax yield benefits of debt combined with the typically lower cost of debt as compared to equity financing options. Equity shareholders typically require a much higher rate of return because of the risk of that investment,” Zigrang says. Daniel Frier, founding partner of the Healthcare Law Firm of Frier-Levitt says debt increases inject funding into the practice, and helps the practice expand. It also benefits the business because it helps to expand the company’s reach within the community, increasing exposure and value. Zigrang says that not all projects are a success for companies, so increasing debt could end up harming the business in the long-run. “Some companies take on debt for expansion, but they don’t always have the resulting intent of success. The debt is taken out at a level that puts the company at risk for bankruptcy, then the value of the company would be discounted to reflect that increasing probability of incurring the bankruptcy costs,” Zigrang says. How Would a Potential Buyer View the Debt? “With these types of projects, if you’ve seen one you have seen one. Individual investment projects need to be valuated on many different factors including the expected rate of return. That takes into account of whether debt can be seen as good for the expected cost of capital for the project. These are generally considered acceptable investments and can increase the value of the firm. However, the debt financing, due to its primacy over equity, or if it is over utilized, could lead to increased risk of bankruptcy, leaving equity holders with little to no value,” Zigrang says. He adds that the whole issue of impressing buyers is a balancing act that has to be done with the cost and benefits that impact the investment of the expansion project. Alex Kajan, Director of Business Valuation with Pinnacle Healthcare Consulting says when valuing a business, he will typically assume the buyer will rely upon a level of debt consistent with market norms. “Six to eight years ago, debt would average approximately 25% of the capital structure of a typical company in the healthcare industry. As interest rates have remained low, this has increased to around 40%. So, under the assumption that the buyer will take advantage of the low interest rate environment, the weighted average cost of capital, which considers an entity’s cost of debt and equity financing, will decline, thus increasing the value,” Kajan says. Zigrang says that after a sale, debt is usually not transferred to the new owner, but the consequences really depend on the transaction. He says there are typically two types of transactions. One being an asset transaction where the buyer acquires the assets of a company free and clear of all debts and the seller is responsible for paying off the debt. “This is much like when you sell a house. You sell your house to someone for 300,000 dollars. That is the value, but if you still have a 150,000 dollar mortgage, you are responsible as the seller to pay off any remaining debt,” Zigrang says. He adds that sometimes there is a stock equity sale, which means a buyer also acquires the assets and the debt. In return, they are paying an equity level of much lower interest per unit than they would an asset sale. Zigrang says buying into a business might be different than other situations because of the time horizon of investment. “Certainly, there is traditional commercial debt, which is determined by the subject entity, cost of debt, the interest rate on the outstanding debt within the company. There is also market derived expected cost of debt. One market based method of estimating cost of debt is to collect the current yield rates for publicly traded fixed income securities such as corporate bonds that have similar risk profiles to the company in which you are acquiring,” Zigrang says. Currently, Zigrang says the cost of debt for such high yield bonds is around 6 to 6 ½ percent. “Typically cost of equity is higher than cost of debt. There are three commonly used methodologies to determine that cost of equity. There is a build up method, capital asset pricing method, and arbitrage pricing theory. Really, what depends on this is the riskiness of investment. The higher risk involved in the speculative investment of the company, the more return you want. The higher cost of equity of the result,” he says. Kajan says capital markets have become much more liquid over the past few years and with he Federal Reserve holding the Federal Funds Rates near zero, rates on debt financing remain very low. “The interest rate on that debt is going to be contingent on whether you are looking at construction financing or term financing for equipment or an acquisition Also, for an ASC, it will fluctuate based on the center’s case mix, operating history and a variety of other factors. Current rates generally range from 4-8% for debt, Mezzanine financing, which is subordinated to debt, but a step ahead of equity, will cost around 13-20%, while equity is around 20%,” Kajan says. CENTENNIAL, COLORADO (March 1, 2016) – Pinnacle Healthcare Consulting announces the launch of Pinnacle Healthcare Insurance Advisors (PHIA) to its current offerings. Effective immediately, an industry-leading healthcare industry insurance and risk management executive is transitioning to a new leadership role within Pinnacle. The move expands Pinnacle’s ability to respond to increasing client requests for technical insurance solutions to help manage their ever-changing, complex business risks. PHIA will offer risk solutions such as medical professional liability, management/executive liability, cyber risk, customized physician disability, stop loss, reinsurance, captives, equipment warranty, and property/casualty for physicians, hospitals, senior living facilities, life science and medical device firms, health technology, ambulatory surgery centers, accountable care organizations, and many other healthcare related firms. PHIA will be led by Michael D. Reis, ARM, CRIS. Mike is a recognized expert in insurance and risk management for the healthcare industry. Mike has over 20 years of experience in senior practice leader and business development roles for some of the world’s largest risk advisory firms. He specializes in medical professional liability, executive protection, cyber risks, group programs, strategic partnerships, alternative risk financing such as captives, and transactional solutions (M&A). “As Pinnacle expands, we have sought to develop services that not only complement one another, but also address health organizations’ most difficult challenges,” stated David White, Principal and Partner. “This strategy makes Pinnacle uniquely positioned in the industry to positively affect client risk management and business performance in multiple areas. PHIA represents another dimension in this strategy,” White added. With these additions, the firm’s size increases to 56 team members across 16 office locations around the United States. Pinnacle’s mission is to deliver high value advisory services that help its clients manage risk, improve performance and achieve strategic objectives. The firm’s vision is to create a dynamic organization that thrives on solving problems and devising lasting solutions for its clients while providing a professionally fulfilling and rewarding work environment for its people. Founded in 1998, Pinnacle Healthcare Consulting is a dynamic healthcare consulting company with expert resources to assist hospitals, physicians, and other health care organizations with operational, planning and transactional support needs. The consulting divisions and affiliated companies provide the health care industry with a multitude of resources and far reaching expertise to improve business performance. Pinnacle is a trusted advisor to a wide array of both for-profit and not-for-profit health organizations nationwide and provides services through five consulting divisions including Compensation Valuation, Business Valuation, Strategy and Operations, Coding and Audit, and Medical Practice Advisory. Affiliates of Pinnacle include Physician FMV, LLC, a web-based compliance support program designed to help health systems comply with complex physician compensation arrangements; Assistive Coding, LLC, a professional services company providing outsourced medical coding services; NorthGauge Health Advisors, LLC, an independent clinical peer review services company that leverages an expert physician network to address questions of clinical decision-making, medical necessity and related matters; and Pinnacle Enterprise Risk Consulting Services, LLC, with offerings spanning compliance, internal audit, litigation and independent review organization services. For more information, please visit www.AskPHC.com/PHIA. In a healthcare M&A transaction there are times when the value of the selling business is not on the same level as both the buyer and the seller. Perhaps things were missed in due diligence, or the buyer cannot raise the funds the seller is asking for. Regardless, these issues occur, and The Ambulatory M&A Advisor shows the different ways that sellers and buyers can potentially bridge the value gap and seal a deal with minimal roadblocks. Peter Greenbaum, Business Law and Healthcare Attorney for Wilentz says that a valuation gap mean between a seller and a buyer is all about perception and expectation. “A seller perceives their business to be worth more than a third party perceives it to be; it gets back to perception. It’s not uncommon that sellers want as much as they can and buyers want to pay as little as they need to. You have a natural conflict in the way money works, and it oftentimes results in a gap in the valuation,” Greenbaum says. Alex Kajan, Director, Business Valuation with Pinnacle Healthcare Consulting believes that the most effective way to bridge this gap is to find ways to grow revenue, reduce expenses, or reduce the riskiness of an investment in the selling company during the years leading up to the sale of the business. “There are a number of ways to do this and all of these are taken into account in determining the fair market value of a business. Adding ancillary services to the business can enhance revenue potential. Utilizing mid-level providers or negotiating better contracts with vendors can both help reduce expenses and enhance profitability. These are the issues that most business owners easily identify, but often neglect to consider the riskiness of an investment in their business. Concentration of referral and revenue sources, key person risk, lack of geographical diversification, and poor payor mix are common risks identified in the valuation process,” Kajan says. Kajan adds that if an owner did not focus on growing revenue, reducing expenses, or reducing the riskiness of an investment in the business prior to initiating their exit strategy, other methods can be employed depending on the facts and circumstances of the transaction. For example, does the owner wish to retire or is there potential to remain engaged in operating the business to some extent. Greenbaum goes on to explain that there are many ways that a buyer and seller can bridge the gap between the differences in value that may arise. According to Greenbaum, the earn out provision is a very typical way of bridging that gap because typically in an earn out, the buyer can reward the seller slightly more than they otherwise would have. It allows the seller to, while taking some risk, get a greater upside. At the same time, from the buyer’s perspective, the buyer has a comfort level that the business and revenue stream that it is buying, is in fact there. Therefore, often times in the earn out, a buyer will share more than they would otherwise would have been paid if it was a straight up purchase price. Brian Berlandi, managing partner, Berlandi, Nussbaum & Reitzas LLP adds that an earn out is also the kind of gesture a seller makes for a buyer who might have difficulty getting traditional financing from a bank therefore, pushing a value of the business that the seller does not see as fair. Berlandi says that this is one of the benefits involved in the deal for the buyer. Kajan explains that earn out provisions can be useful if a seller believes the current fair market value is not representative of what the fair market value would be over the next several years. Generally, with an earn out provision, there is an upfront payment for the business and an additional payment (or payments) that the seller will receive contingent upon achieving predetermined financial goals after the transaction closes. “If the seller believes the business is truly worth more than the current fair market value, this is a way for the seller to capitalize on the future success of the business should the financial goals be achieved. I would note that to the extent the earn out provisions are aligned with services referred from the seller to buyer post-transaction, legal counsel should be consulted as the earn out could be viewed as a payment for future referrals,” he says. Kajan says another way to bridge the gap is through seller notes. He says a seller note allows the buyer to pay for the business over time. If the seller is willing to forgo a large portion of the upfront payment, the note can provide interest for the seller over time. This could be an attractive option for a business owner who is willing to shoulder this additional risk in hopes of a greater return. Additionally, as dollars in the future are worth less than dollars today, this could be attractive to the buyer if the interest rate on the note is manageable. Greenbaum says that from a buyer’s perspective, the seller holding the paper will give the buyer a little more comfort that the seller will stand behind the business. “A buyer’s fear is that the seller’s representation in terms of the revenue stream among other things, may not materialize. If the seller is willing to hold paper, it will give the buyer a little more comfort that the seller will stand behind what the seller has in fact said the economics are. If it’s not there, then the seller is not going to get paid. It’s a way of keeping the seller’s skin in the game that otherwise would not have been there if it was an all cash deal where the buyer either had their cash in pocket or from a third party bank. Once that happens there is no real skin in the game from the seller’s perspective, and that is when the buyers become concerned,” Greenbaum says. Although selling less control of the company to a buyer is a way of addressing the bridging of the gap in a sale, Greenbaum says more often than not, it can create problems. “When a buyer comes in and wants to buy a company, they typically want to buy one hundred percent of the company; they do not want a partner. They do often keep the sellers around or need the sellers to stay around, whether for employment related reasons or from a transitioning perspective in the sense that the sellers are the ones knowing how to run the business and therefore need to effectively teach the buyer,” he says. Kajan says the success of this strategy really depends on the seller’s willingness to remain engaged with the business over time. “Buyers are generally seeking to gain control of a business. To the extent a seller is willing to sell a controlling interest in their business and a buyer is willing to allow a seller to remain engaged as a minority interest holder, there could be value to positive changes the buyer could make to the business after the transaction occurs. This can come in the form of greater geographical reach, economies of scale leading to more favorable contracts, etc. The issue this can create for a seller is that they now have a minority interest in a company that is more difficult to liquidate and they also now lack control should disagreements come about in the future. A seller really has to consider what benefits the buyer could bring to the table post-transaction and whether or not they want to remain onboard with a business they no longer control,” Kajan says. Thank you for you continued support. We wish you a happy and healthy New Year! Season’s Greetings! 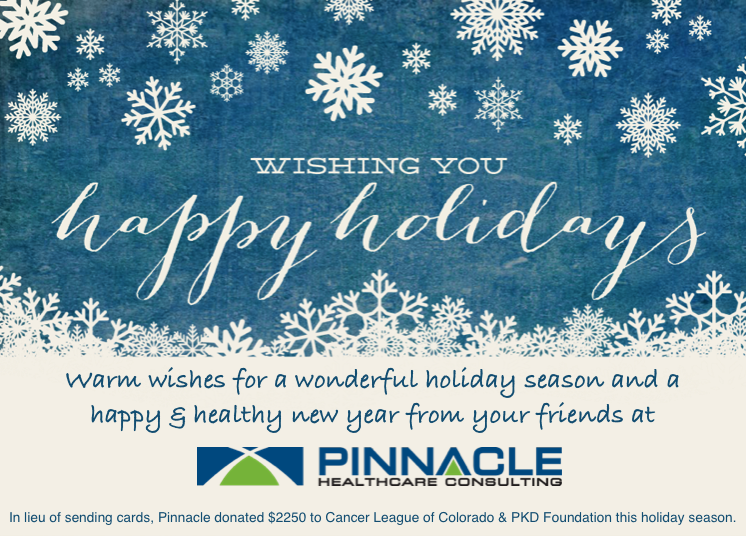 From all of us at Pinnacle Healthcare Consulting! We would like to personally thank you for your continued support and best wishes in 2014! Pinnacle Healthcare Consulting Wishes You a Relaxing Thanksgiving! Though a single day is set aside, the thankfulness is year-round. 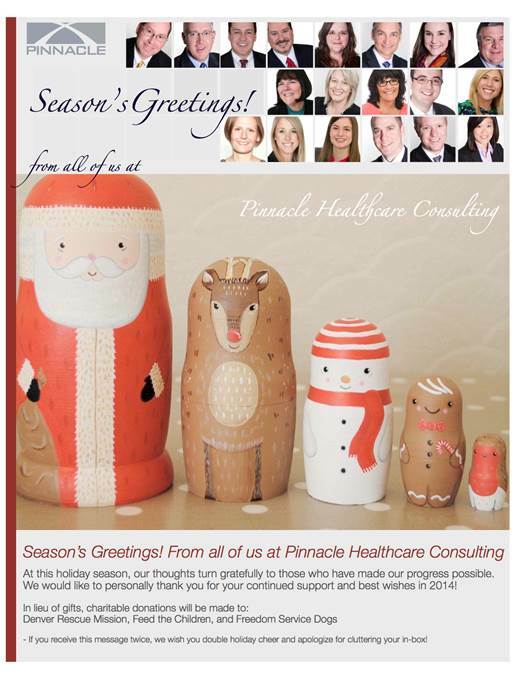 The Pinnacle Team is grateful for your friendship and business. Wishing you a relaxing Thanksgiving with friends and family. Visit Pinnacle Healthcare Consulting at the Fraud and Compliance Forum – Baltimore! This program is designed specifically for compliance officers and health attorneys who must advise their clients and institutions on the latest developments in fraud and abuse and compliance issues. Attendees will hear from leading private practitioners and representatives from the Office of Counsel to the Inspector General, the Department of Justice, and the Centers for Medicare and Medicaid Services. The HITECH Rules are Here and We Need to be in Compliance: What Should you Be Doing? The Fraud and Abuse Practice Group, will hold a luncheon and presentation on September 30. HCCA will hold a luncheon and presentation on October 1. Please note, there is an additional fee; pre-registration is required; space is limited. We will not automatically be printing binders for everyone. All materials will be available on a website prior to the program and handed out on CD at the program. For those who still do want the binder they will be available for an additional fee; please order on the registration form.